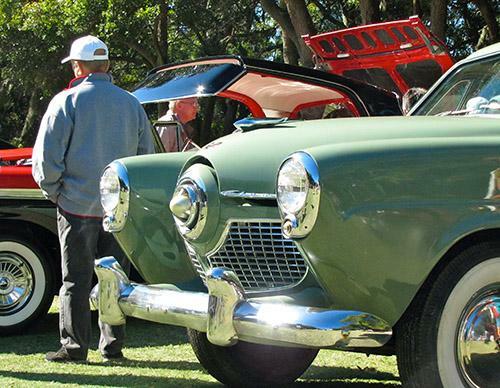 The 2014 Concours d’Elegance on Hilton Head Island was a spectacular convergence of car collectors, car lovers and a loyal fan base that make the annual trek to Hilton Head Island for the prestigious car show. 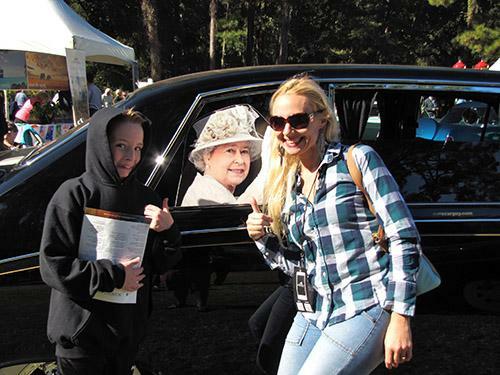 This year’s projected attendance was 25,000 people and 350 cars. A 1938 Bugatti Type 57C coupe walked away with the Best in Show award, one of only 17 made. Two other cars won major awards: a 1926 Chrysler Model 75 Dual Cowl Phaeton was the festival’s “People’s Choice” winner and a 1958 Studebaker Golden Hawk took the Paul Doerring Founder’s Award for Most Outstanding Post-War car. I took my 10 year old son and husband with me to the event on Hilton Head Island. Trolleys bused us from the Honey Horn plantation to the stately 14,000 square foot antebellum Port Royal Clubhouse and the picturesque golf greens that spill out in the foreground and to the left and right of the Clubhouse grounds. The Concours d’Elegance is a significant event for me as it is the very first outing I took my infant son to 10 years ago. He was bundled in the stroller posing by cars with me sweetly sleeping unfazed by the people or trophy automobiles that lured me to them. So here we are 10 years later and the event has experienced vast growth! This was evident by the Cirrus SR22 luxury aircraft on display with its uplift windows. 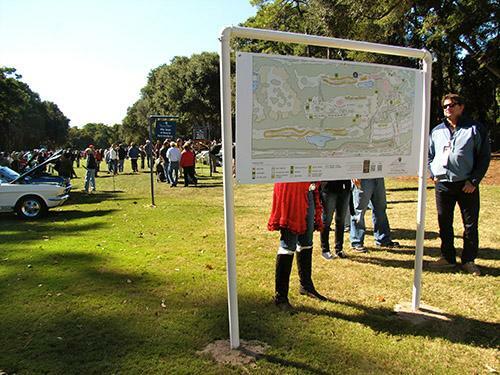 We were greeted by the future of the Concours d’Elegance as it continues to add new exhibits to its showfield. 2015 will bring the introduction of aircraft exhibits and test flights. 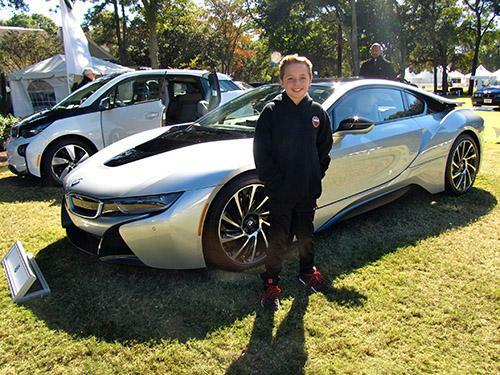 First automobile to truly “wow” us was the plug-in hybrid BMW i8. Its curves and layering design were unlike anything I personally had seen on display before by BMW. The future of innovation seems like a cliché when speaking of what this vehicle represented. It was not the only one at the automotive event that demonstrated the future but the first that caught my eye. I didn’t get any great shots of the Tesla cars on display but they are worthy of a “shout out”. Both of these cars shown below were stunning tributes to the American legacy of automobiles from Modern Production years of 1949-1973. First, a 1951 Studebaker Champion Starlight Coupe owned by a local Bluffton, SC couple. Period critics of the radically styled models commented by asking the rhetorical question, “Which way is it going?” (Comedian Fred Allen quipped: “Next year’s Studebaker is coming out with a model that you won’t be able to tell if it is going sideways.”) Beside it was a red and black 1951 Ford Fairline 500 Skyliner Retractable. 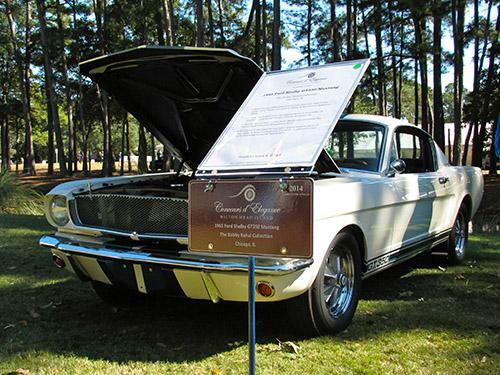 It was such a sensation when it was first introduced that Dwight “Ike” D. Eisenhower ordered an early model. It was a sight to behold – the big steel roof and rear-deck panels, operated by a bevy of servo motors, relays, screw jacks, assorted cables, springs and pivoting arms that all work together to move the hardtop. I was halted by the beauty of the 2014 Pinnacle Award Recipients Joseph and Margie Cassini’s four car collection, a representation of the best of their collection. 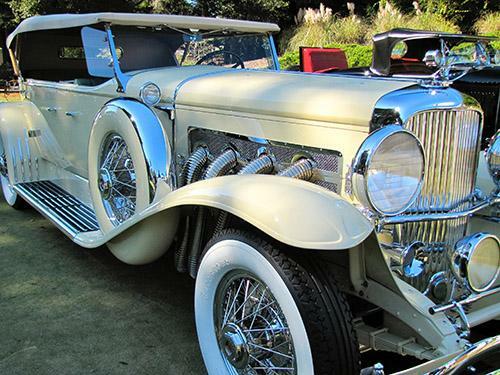 Pictured below is the 1931 Duesenberg Model J Tourster. The SC-specification external exhaust pipes were jazzy period design. This Model J has an exhaust system dump at the flip of a lever on the floor. This rare exhaust-dump system bypasses the exhaust system and redirects the airflow through a three-inch open pipe. The 18th Hole and the 1st Hole served as Showfields with cars as well as an exhibit of motorcycles lining both sides of the fairway. Below are some other notables that stopped me along my amblings around the Showfields and Motoring Midway. 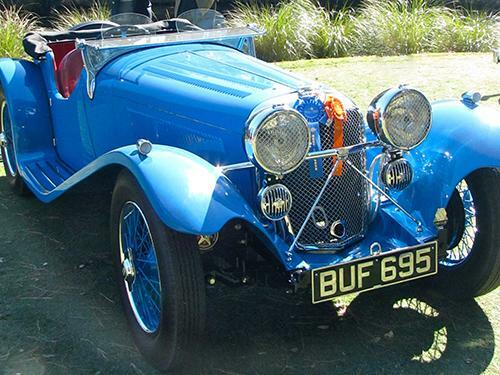 Along the Honored Marque of Iconic Jaguars was the 1935 SS Car, Ltd SS 90 with its blue tint glistening in the Sunday sun. The Swallow Coachbuilding Company – the predecessor to Jaguar – produced luxury automobiles out of Blackpool, England. I’ve always been partial to American Muscle and several stopped me along the way. I could’ve included several but chose this 1965 Ford Shelby GT350 Mustang for the blog. Does the next car need an explanation as to its inclusion? 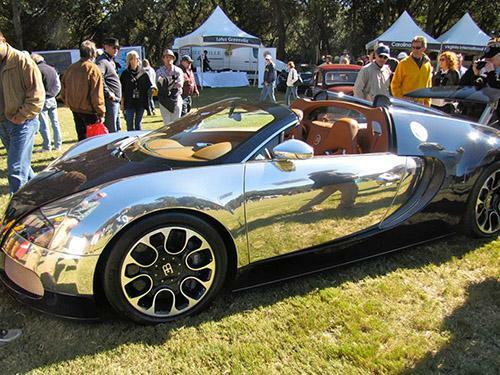 This 2010 Bugatti Veyron Sport with blue tinted carbon fiber and polished aluminum exterior boasted a jaw-dropping price tag of $4 million dollars. It has an 8 liter 16 cylinder engine with 4 turbochargers producing 1001 horsepower and 922 lb.-ft. torque. It gets 14 miles per gallon on the highway at 70 miles per hour or… 1.4 gallons per minute at full throttle! If you can afford the four-million dollar price tag though, you can probably afford the mind numbing fuel costs! A stop by the Life of the Rich & Famous exhibit in the Motoring Midway provided a fun photo op with my son by a 1989 Daimler DS420 Limousine specially built for Queen Elizabeth and Prince Philip during their week-long visit to New Zealand for the Queen’s 50th year tour in February 2002. 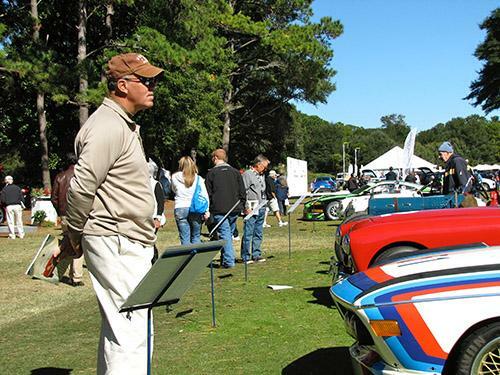 The Hilton Head Island Motoring Festival & Concours d’Elegance selected Jaguar as the Honored Marque for the 2014 Festival. 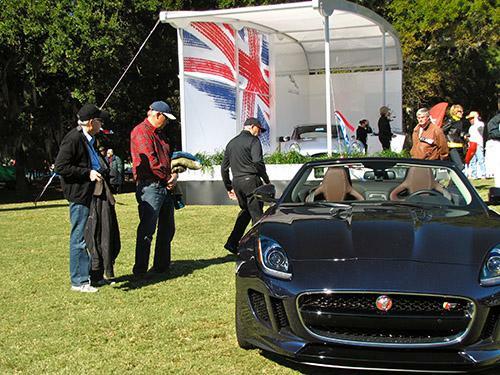 Pictured here is a 2015 Jaguar F-Type S Convertible. A look across the lagoon at both The Racers de Savannah Ring and the Ford Motor Company showcase beyond. The Porsche showcase was my favorite display with Jaguar a close second. It was a great Sunday for a walk along automotive’s finest of yesterday and today. Over 45,000 South Carolinians are employed by 250 automotive-related companies located in the state. South Carolina ranks second nationally for exports of automobiles and first in the number of tires exported. Hilton Head Island, South Carolina makes for great destination travel for such an event. Surrounded by pristine golf courses, palmetto trees, and the ocean a short distance away – what better location to take in such amazing cars? 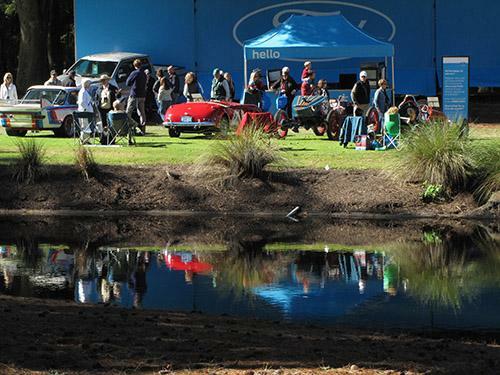 I can’t wait to see what the 2015 Hilton Head Island Motoring Festival and Concours d’Elegance has in store for its loyal patrons. I will be one of them!